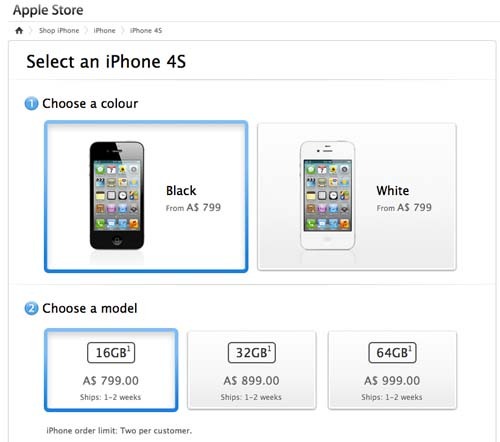 The Australian online Apple Store has now been updated, with the iPhone 4S now available for pre-order, starting at $799.00 for the 16GB model. Both black and white models are available, with the 32GB costing $899.00 and the 64GB costing $999.00. The iPhone 4S is unlocked, so users are able to use the phone on any prepaid network of their choosing. Shipping times are posted as 1-2 weeks, and there is a limit of 2 iPhone pre-orders per customer. Australian carriers such as Optus, Telstra and Vodafone are still listing the iPhone 4S as “coming soon” on their websites, but will soon be releasing their own prices on standard 2-year contracts.